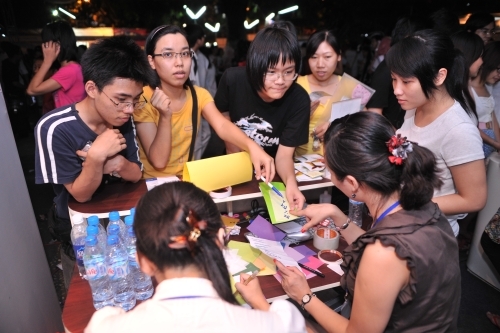 I am Nha from the Japan Foundation in Hanoi. Nice to see all of you with my second blog writing, by the way, I am so sorry to keep your guys waiting in such a long time. Yes, Mio-san, I have enjoyed the news on Acctive Expo and Robot Paro via NHK wesbite. 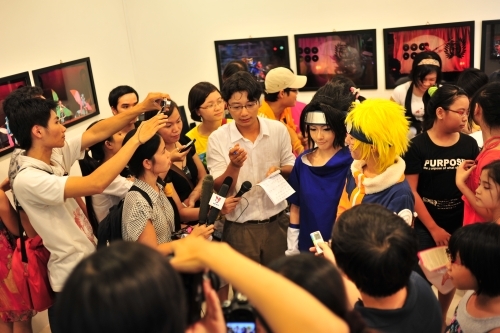 I am sure that you are longing for news on Cosplay event. You may be surprised to hear that the unforgettable memory for me in this event is … the heavy rain which flooded our booth with water. Actually, we were struggling to fix our booth and to bail water out some hours in the morning of the day due to sudden heavy rain. 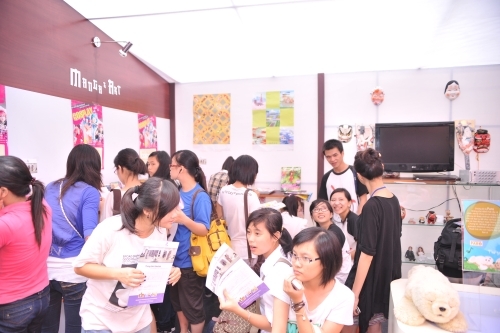 I wish you could see how quickly the Japan Foundation staffs in Hanoi formed a cleaning team to back our booth normal. I hope there are some pictures available. 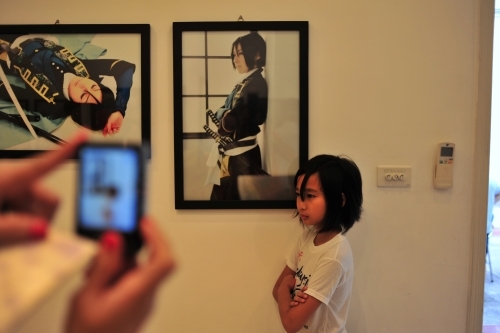 Well, let me start with the Cosplay Exhibition of YuRiE at the exhibition hall of our center. What a pity that RiE-san could not accompany with YuRi-san to come to Vietnam this time; however, Shiguma-san, one of the other famous cosplayers in Japan and YuRi’s good friend, could visit Hanoi instead for our effervescent cosplay event. You can guess what characters YuRi and Shiguma performed in the opening. Find your answer in the following series of photographs!!!!!!!!!!!!!!!!! 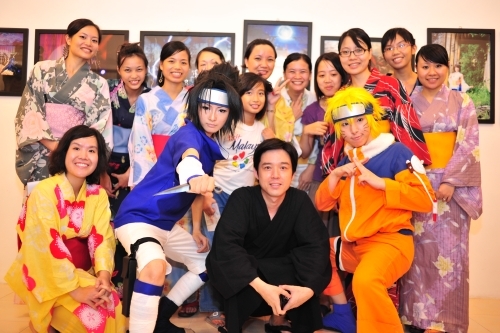 Suggested by Mr. Yoshioka (in black and in the middle), the staffs all wore Yukata. 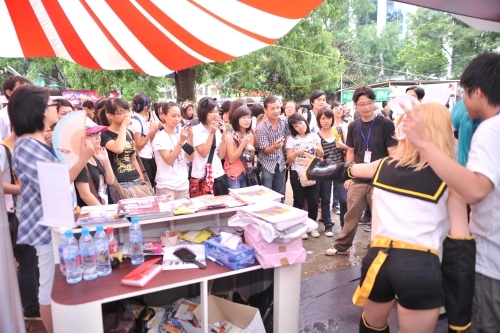 After the opening party, YuRi and Shigma, as well as JF staffs quickly moved to the venue of Acctive Expo 2010 to set up the JF booth and to rehearse cosplay performances. 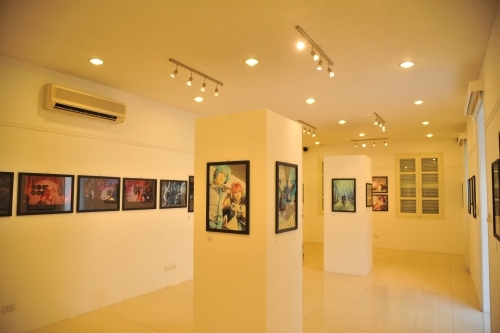 Acctive Expo is an annual event organized by Animation Comic Community (http://acc.vn/). 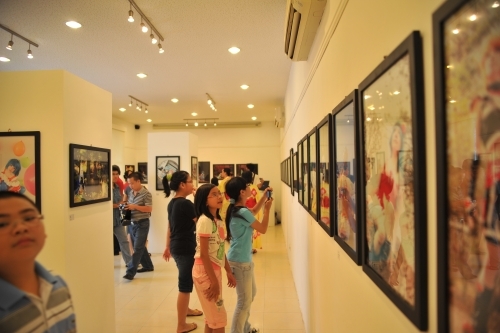 It began in 2007 and this year’s event was the third time (there was no Acctive Expo in 2009). 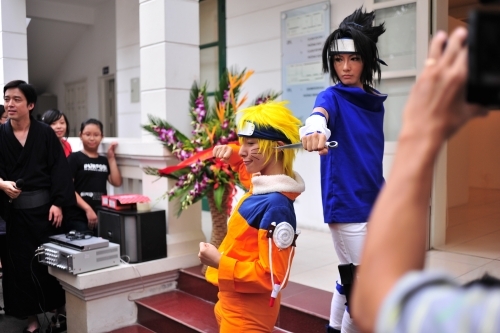 According to one of the organizing staffs, cosplay in Vietnam began in 2007, and this was the first time for them to welcome world-class cosplayers from Japan. 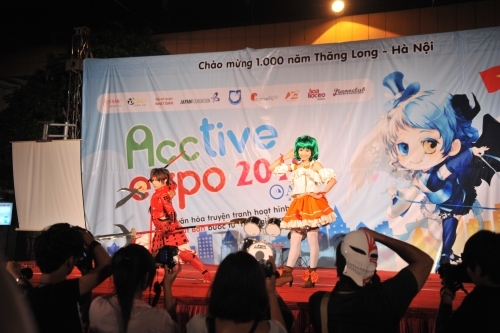 The expo in Hanoi attracted more than ten thousands of teenagers and cosplayers in one day. Here are the event photos ! Please pay attention to the water on the ground! A heavy rain had just gone by. 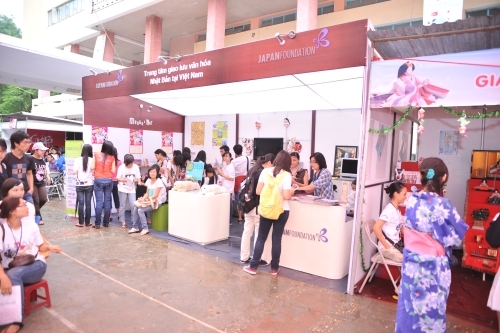 Our booth had been in flood from 11 AM to 2 PM. Unfortunately there are no photos of the exact time when our booth was in flood, because we were so busy to scoop water out of our booth. So use your imagination from this “after the heavy rain” photo. Thanks God that in the late afternoon the rain went out and the sun came back. 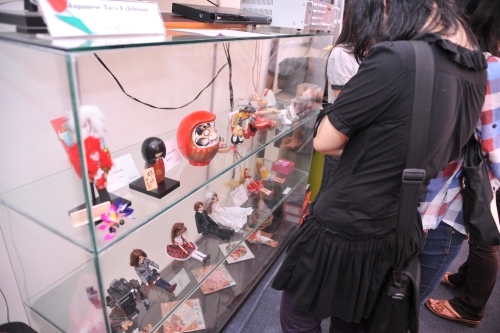 Over 30 booths on Japanese dolls, toys, mangas, foods and drinks, regained their energies and the outside stage performances were also back to normal. Our JF booth was the biggest one, providing such items as the therapeutic robot PARO, a mobile library for Japanese manga & magazines, toys display, J-POP video clips, , Japanese language quiz on the internet , name writings in Katakana and special session to take photographs with YuRi and Shiguma. Our booth was all the time packed with a great number of people. Let me share the atmosphere through photographs. While the first guests in September were YuRi and Shiguma, our second guest was Dr. Shibata who is the inventor of the therapeutic robot PARO and came for the lecture on PARO with demonstration. As some of you may know, the robot PARO is known worldwide as the most therapeutic robot holding the Guinness World Records. It has a calming effect on and elicit emotional responses in patients of hospitals and nursing homes, similar to Animal-Assisted Therapy. 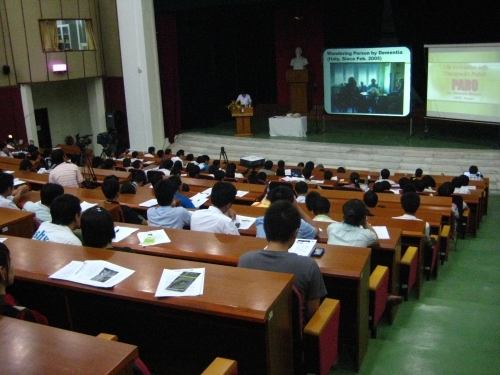 Dr. Shibata gave a lecture for more than 200 technology students at Hanoi University of Science and Technology. He explained how PARO worked for therapy, especially for elderly people and people at medical facilities, with the demonstration of 2 units of PARO. During the Q&Asession, many hands were raised; however due to the time limitation, we had to limit up to 8 questions to give full answers from Dr. Shibata. 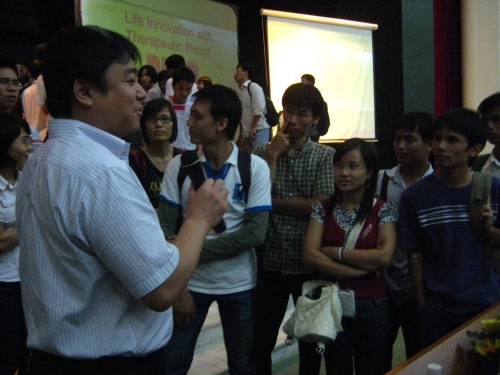 The enthusiastic students were remaining in the conference room to touch PARO and ask more questions to Dr. Shibata until the very last minute to close the doors. It was nice for us to know that both of the above two events were broadcasted by NHK news in Japan. 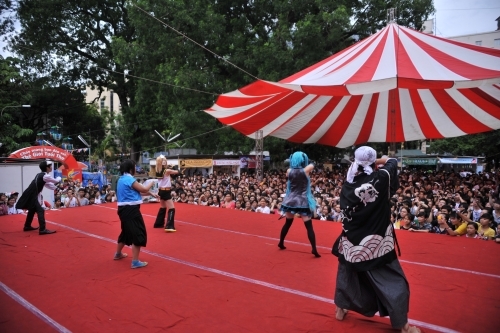 Today is the end of September, I would like to be back with updating information on Japanese film festival, Furoshiki Design contest and Rakugo performance. And I am very eager to see your next blog, Nunzia!